Foothills, montane, subalpine. Streamsides. Spring. Fish Creek Trail, May 21, 2006. Narrowleaf Cottonwood is the dominant tree for miles along foothill and montane streams such as the Dolores and Animas Rivers near Dolores and Durango, Colorado. The tree forms extensive stands and commonly grows tightly packed, slender, and to 60 feet tall. Green leaves cover most trees from bottom to top because the trunk has a raggedy collection of small limbs, all of which produce leaves. Populus angustifolia and Populus deltoides hybridize. See Populus xacuminata. "Populus" is Latin for "people" and is the classical Latin name for the tree. "Angustifolia" is Latin for "narrow leaf". Populus angustifolia was named and first described by Edwin James. 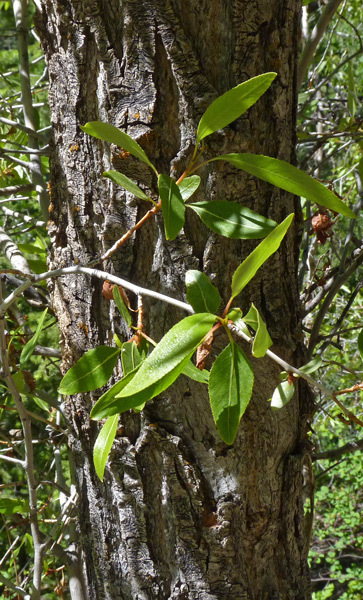 Narrowleaf Cottonwood bark is rough and gray and leaves are long, narrow, and very finely serrated. 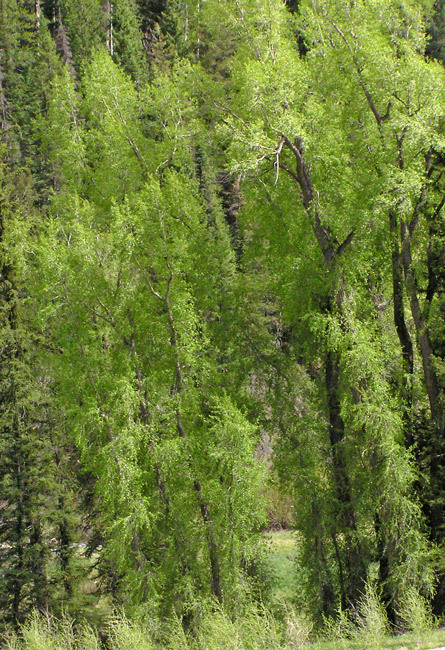 Narrowleaf Cottonwoods are in the Willow Family and, because of their long narrow leaves, young trees are often mistaken for what we generally call a "Willow". But give the small plant time to grow and it will mature into a large shade tree. Roaring Fork Road, January 24, 2007. 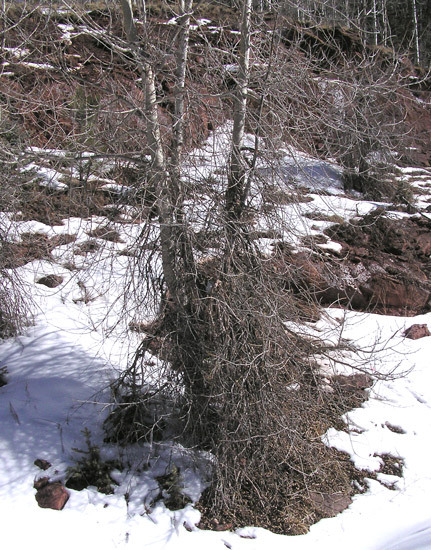 Winter allows you to see the mass of interlaced branches characteristic of Populus angustifolia. Contrast this growth pattern with that of Populus deltoides with its long branchless trunk and crown of leaves. Very old Populus angustifolia trees often loose their numerous lower branches and from a distance look very much like a Populus deltoides. 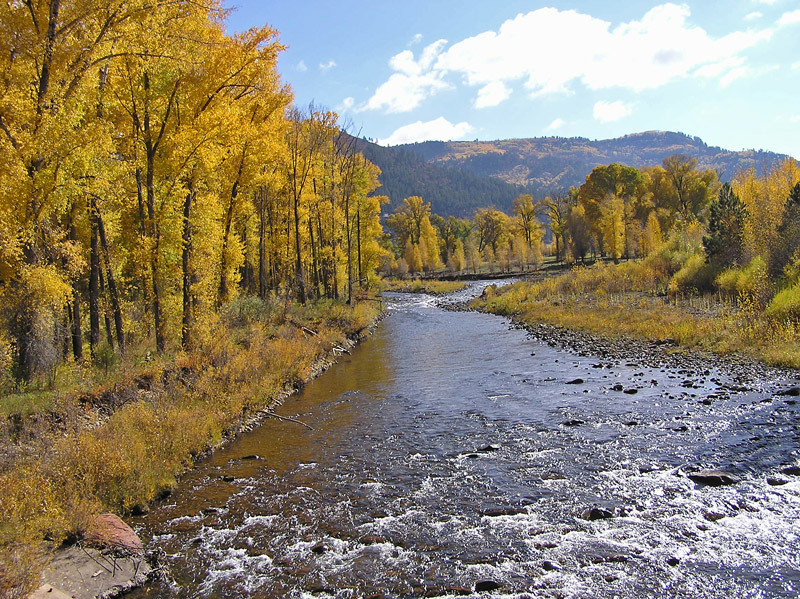 Dolores River, October 12, 2004. Narrowleaf Cottonwoods along the Dolores River and Aspens on the mountain sides put on a spectacular fall show.